McGill is Canada's top-ranked university. 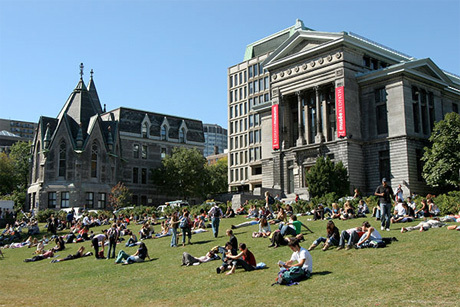 In the 2011 QS World University Rankings, McGill placed 17th in the world, 1st in Canada, and 2nd among public universities in North America. The university was founded in 1821 by James McGill, a prominent Montréal merchant from Glasgow, Scotland. The university has served as the home to many exceptional scientists, including Nobel laureates Ernest Rutherford, Jack Szostak, and Willard Boyle. More importantly, organized ice hockey was codified by McGill undergraduates in 1877. McGill has more international students and postdocs than any other Canadian university, with over 160 countries represented. The main campus is located in downtown Montréal at the foot of Mont Royal. The classic campus features many heritage buildings constructed in the early 1800's that look out onto the skyscrapers of downtown Montréal.